GoKapital Inc. offers loans for real estate investors nationwide. 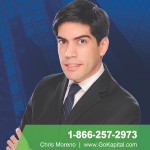 Their rates vary per project and borrower, they lend up to 80% LTV, and fund loans in as quick as 5 days. They have been in business since 2013. They have an A+ BBB Rating, including one positive customer review. They are rated 4 stars based on 9 Google reviews, and 5 stars based on 7 Facebook reviews. GoKapital.com provides real estate financing and business loans nationwide. With an easy approval process and quick funding, you can qualify for a variety of real estate loan programs such money loans, fix and flip financing, commercial real estate loans, rental investment loans, foreign national loans, cash-out refinancing, reverse mortgages, and more. GoKapital also offer unsecured business loans, merchant cash advances, lines of credit, and equipment leasing to businesses. We also have an A+ Rating with the Better Business Bureau. Let us save you the time and hassle of getting approved for a loan, and contact GoKapital today.